Sam Gilliam, Yves Klein Blue, 2017, acrylic on Cerex nylon. Installation view, central pavilion, Venice, 2017. From the 57th Venice Biennale. Photo: David Velasco. 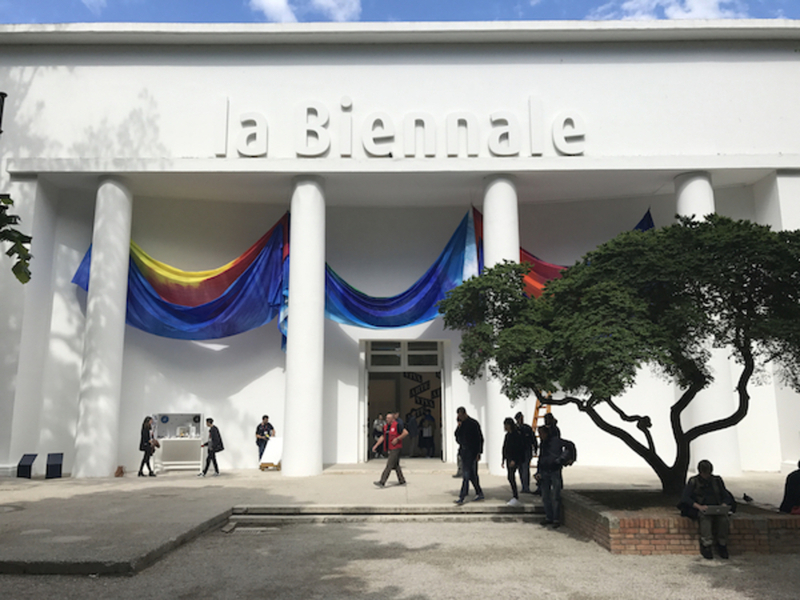 Sam Gilliam is a Washington, DC–based artist whose vibrantly hued unstretched canvas Yves Klein Blue, 2017, will be draped across the entrance to the Giardini’s central pavilion at the Fifty-Seventh Venice Biennale until the show closes on November 26, 2017. Here, Gilliam speaks of his earlier participation in the Biennale, forty-five years ago, and his continued investigation into the expanded field of painting. His work is also featured in “Soul of a Nation: Art in the Age of Black Power,” which will be on view at Tate Modern from July 12 to October 22, 2017. IN VENICE, I’m showing Yves Klein Blue, an outdoor drape piece that hangs on the front of the building. Suspended from the ceiling of the colonnade entrance, it blows in the wind. Seahorses was my first outdoor drape, which I did in 1975 for the Greater Philadelphia Cultural Alliance at the Philadelphia Museum of Art. Installing that piece on the outside of the museum was fantastic because we used a hook and ladder truck from a division of the fire department. We got up to the rings along the building, and we did the installation. Around 8 PM that night we finished, and, sure enough, there was a major storm coming off the Atlantic. We went to dinner, and we came back. There was this really beautiful moment when the strong winds inhabited the piece—rays of light shot through the fabric, creating shadows in the folds. I wanted Yves Klein Blue to billow like that early work. I first encountered Yves Klein while stationed with the army in Japan. There was a Klein exhibition in Tokyo. The Gutai group was being born, and I was in the army, and I thought nothing about whether I would be an artist or not. In fact, I probably thought that I would never be an artist. But Klein had an effect on me, and I thought about making art beyond the interiors that it is usually presented in, about making art more in the outside world. In 1972, I was in Venice to install my work Baroque Cascade, which measured ten by seventy-five feet when undraped. I was there alongside Ron Davis, Diane Arbus, Keith Sonnier, Jim Nutt, Richard Estes, and Walter Hopps. I went over early to assist with the installation. I was particularly excited to show my work because of my desire to connect painting and architecture. All that is happening now—the immigration crisis, the bombs, the gutting of the National Endowment for the Arts, the presidential corruption—was present in the 1970s. It seems worse now, but history, like art, is cyclical. Yet, I think we’re in a much worse place than we were in the ’60s, when the NEA was initiated by the Johnson administration. This time, it’s almost the same, but where are our educational institutions? To gesture at the cycles of history is art at its greatest capacity. Yves Klein Blue is about participating in a continuum—it’s about connecting the precursors with the present. After all, blue is what we think of first when we imagine a Klein, but there is something autobiographical there for me as well, which harks back to my early formative years. To me, art is about moving outside of traditional ways of thinking. It’s about artists generating their own modes of working. We need to continue to think about the whole of what art is, what it does. Even though my work is not overtly political, I believe art has the ability to call attention to politics and to remind us of this potential through its presence. For more reflections on the NEA from Johnie Scott, Barbara Rose, Maya Lin, Ed Ruscha, and Ian Volner, see the Summer 2017 issue of Artforum here.